If someone gave awards for endurance to old mining towns, the Central Nevada mining camp of Tybo would be an easy winner. Unlike many of Nevada's abandoned 19th century mining camps, Tybo, which is located 60 miles northeast of Tonopah, has managed to reach the 21th century with an impressive number of its historic structures intact. Silver was discovered in the Tybo Canyon area (the name is derived from "tai-vu," the Western Shoshone word for "white man") of Central Nevada in 1866, although large scale mining didn't begin until about six years later with construction of a smelter. While known as a fairly peaceful camp in its early years, by the mid-1870s it had evolved into three distinctive districts divided by ethnicity (Irish, Cornish and Central European) and had experienced some cultural tensions. Ironically, one of the few occasions during which the three groups were unified was when they banded together to repel Chinese woodcutters who attempted to settle in the area. By 1876, Tybo had 1,000 residents and a small commercial district that included five stores, an express office, saloons, three hotels, two restaurants, two liveries, a post office and a newspaper, the Tybo Sun. The town experienced its first mining slump in 1879. The decline caused mines and the local smelter to shut down and the population soon plummeted to less than 100 people. By 1880, the newspaper had stopped publishing although a new mill and a brick schoolhouse were built that year. During the next half-century, Tybo's fortunes rose and fell according to the amount of activity supported by local mines. Revivals occurred in 1901, 1905, 1917 and 1925. The latter boom was fairly significant resulting in construction of a 350-ton mill and a new smelter, which sustained the town for the next 12 years. In the early 1930s, the town counted 75 residents. The post office, which had closed in 1906, was reopened. Since the end of the last major boom in 1937, Tybo has supported a string of smaller mining operators. As a result, the town has occasional residents and caretakers to watch over the ruins. To reach Tybo, head east of Tonopah on U.S. 6 for 44 miles to Warm Springs. Continue another 8 miles to the turnoff for Tybo (there is an historic marker near the turnoff). Drive 6.5 miles on a maintained dirt road to the ghost town. 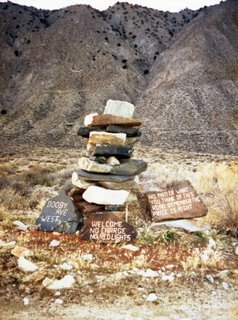 At the mouth of Tybo Canyon, about a mile from the town site is a small cemetery containing a few stone and wood headstones dating to the late 19th century. Wandering down the main street of Tybo, you can find plenty of reminders of the town’s rich history, including a few houses that are still in good shape. Near the town entrance, you encounter the ruins of what appears to have been an old house, its chimney intact but all the other walls gone. All around, poking out of the sagebrush, are the concrete foundations of former mining mill structures and other buildings. A little farther up the road is the impressive stone Trowbridge Store, constructed in the late 19th century. Originally a cash and credit store, it later served as a recreation hall for miners. Despite years of neglect, it is in remarkably good shape with most of its roof intact and glass still in some of the windows. Opposite the store are remains of more recent mining operations including a large, metal headframe and assorted scraps of wood, metal and wire. Up the canyon from the store are a series of wooden structures that date to the 1930s revival, which have been preserved. One is a large bunkhouse while others are smaller houses. Additionally, on the hillside is a sod-roof house constructed using thick railroad ties. 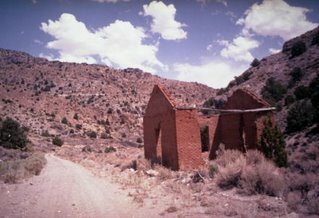 Continuing up the canyon, you pass another large, metal headframe, several wooden buildings and an abandoned truck as well as additional brick walls and foundations. About a half-mile up the canyon from the town center are the picturesque brick remains of the old schoolhouse built in 1880. A special treat for those with high clearance, four-wheel drive vehicles is a trip to Tybo’s charcoal kilns. Located four miles northwest of the town via a very steep and rocky road, the 30-foot high, beehive-shaped kilns, which are in good condition, were built in 1874 of native stone. A good source of information about Tybo is Shawn Hall’s excellent book, “Preserving the Glory Days: Ghost Towns and Mining Camps of Nye County, Nevada,” which is available in local bookstores. The world’s most famous black fire opal was discovered in Nevada’s remote Virgin Valley in 1917. Colonel W.A. Robeling, a civil engineer who helped design and construct New York’s famed Brooklyn Bridge, uncovered the precious stone in 1917. The magnificent 2,610-carat opal, which weighs about one and a half pounds, was later donated by Robeling to the Smithsonian Institute. It’s on display in the Smithsonian’s Gem Hall, along with several other smaller but equally beautiful black opals from Nevada. It was with such knowledge in mind that my daughter and I traveled to the Virgin Valley area, located about 135 miles northwest of Winnemucca, to seek our fortunes. Virgin Valley, in fact, is renowned for its opals, which include not only the rare black fire opal but also a wide variety of other opal-type stones. Geologists trace the origins of the region’s opals back to one of Nevada’s violent volcanic periods, which occurred about 20 million years ago. During that time of great upheaval, a basin was formed in the area. Over the years, the basin filled with sediments and volcanic ash as well as deposits of silica. Eventually, forests that had cropped up in the basin were buried beneath the layers of sediment. The valley’s opals essentially are created by the combination of warm underground water, silica deposits and buried wood. Over time, this geological cocktail develops into opalized wood that can also develop into precious opal stones. In more recent times, geologic forces caused the valley to uplift, which exposed the valley’s clay beds of prehistoric volcanic ash. It is in these beds that you can find precious opals. Since the early 20th century, miners have been working the Virgin Valley ground for opals. One of the oldest mines in the region, which is still in operation, is the Rainbow Ridge Opal Mine. Rainbow Ridge, in fact, is where I was able to do a bit of opal hunting. The opal hunting process, at least at Rainbow Ridge, is that you basically sit down next to a pile of rocks and begin sifting through them to find anything that looks interesting. Opal hunters have two options for their piles—they can either pick through tailings, which are mounds of rocks that other people have already gone through, or, for a bit more money, have a backhoe dump a pile of fresh dirt on the ground, which they can pick through. The picking is where the fun begins. At first, you haven’t the faintest clue what you’re looking for. However, the Rainbow Ridge folks are extremely helpful in providing pointers. Tools are pretty simple and are usually available from the mine. They can include small picks, hammers, shovels, and hand trowels. It’s also essential to have a small bucket of water in which to store your potential opal finds. The reason for the bucket of water is that the ground in Virgin Valley is extremely moist, meaning the opals are accustomed to a wet environment. Opals removed from the moist dirt can begin to crack as they dry out (ask the mine how best to preserve any stones you might find). Once you literally begin to dig in you find that the tailings or virgin mounds are filled with interesting stuff. It’s not uncommon to find opalized wood (it looks like white bone) or hunks of petrified wood. Occasionally, as you sift through the dirt, you’ll also spot glassy-looking rocks. 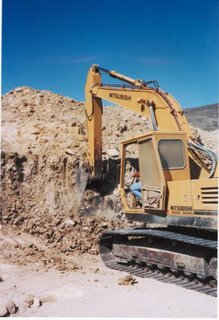 Veteran opal hunters encourage you to save anything glassy-looking in your water bucket because it may yield an opal once it’s been cleaned up. And if you’re real lucky you might even find one of the elusive black fire opals. These magnificent gems are dark-colored stones that, when exposed to direct sunlight, sparkle with the hues of a rainbow. So, did we find anything valuable during our journey to the Virgin Valley? As a matter of fact, my daughter uncovered a pair of beautiful, rainbow-hued opals, each measuring about a half-inch in length. We were able to have them cleaned up and placed inside of a small, glass globe filled with water in order to keep them preserved. My daughter likes to hold the globe to a light to see the rainbow colors reflect off the stones. I don’t know if they are actually worth much but they’re priceless to her. The Rainbow Ridge Opal Mine is located about 35 miles west of the Denio Junction via State Route 140. The road, which is marked, is paved until the last 7.5 miles, which are graded dirt and gravel. The mine is open daily from 8 a.m. to 4 p.m. from May to the end of September. For more information, go to www.nevadaopal.com. In addition to Rainbow Ridge, Virgin Valley is home to several other commercial mine-your-own operators also open from May to September including: the Royal Peacock Mine (www.royalpeacock.com) and the Opal Queen (www.opalqueen.com). Maybe it’s the climate or the location but whatever the cause, it’s clear that life in the tiny hamlet of Gerlach, which sits on the edge of the Black Rock Desert, is a little different from the rest of the world. Of course, the best example of how that uniqueness can manifest is the “Burning Man” celebration, which is held in the desert near Gerlach in early September. The Woodstock-like, week-long event attracts thousands of people and includes the burning of a 50-foot wooden figure. Another of the area’s more off-beat attractions is “Guru Road” or “Dooby Avenue.” The road is essentially a dirt trail lined with large boulders into which clever, pithy, and thought-provoking phrases have been carved. Bizarre visual art made from animal bones, scraps of wood, and assorted trash highlight some of the sayings. Guru Road was the work of the late DeWayne “Doobie” Williams, a retired Gerlach resident who spent more than 15 years carving his philosophical musings in stone and assembling whimsical displays. Williams, who earned his nickname, “Doobie,” because—unlike some—he did inhale, decided to pass the time by carving his observations on rocks. Since the work was hard on his hands, he soon shortened his nickname to “Dooby,” to save a letter. His inspiration for carving words in stone apparently came after hiking through High Rock Canyon, located north of Gerlach, where many early emigrants carved their initials and the date of their passing. Williams began placing the carved stones along a road on the eastern side of the Granite Mountains, located a few miles north of Gerlach. His initial efforts honored his relatives and friends with their names and brief messages but soon he began to wax poetic. Others opined: “The time we enjoy wasting is not wasted time” as well as ““Before you kill a snake think hantavirus” and “There will be no work in heaven no one is going to screw it up." Williams’ large, folk-art sculptures are what usually catch the attention of travelers driving on State Route 34, which is parallel to the dirt Guru Road. Other exhibits address weightier issues such as nuclear weapons and the Vietnam War. Following Williams’ death in January of 1995, the Bureau of Land Management granted the Williams family a right-of-way to ensure the continued existence of Guru Road. Friends, admirers and family maintain the signs and sculptures. A few years ago, the Black Rock Press imprint of the University of Nevada, Reno, published a limited edition book about the road, which includes photos and text by poet Gary Snyder, who discovered Williams’ rock garden in the late 1980s. Unfortunately, the book is out-of-print, although it might be in some libraries. Guru Road is open to the public and easy to find. Drive four miles north of Gerlach on State Route 34, until you spot an official-looking green and white street sign on your left, which says “Guru Road.” Then, turn onto the dirt road and start reading the rocks. It's no surprise in geothermally-active Nevada and Eastern California that there are plenty of areas where the underground turmoil finds its way to the surface. One such hot spot is Travertine Hot Springs, near Bridgeport, California. 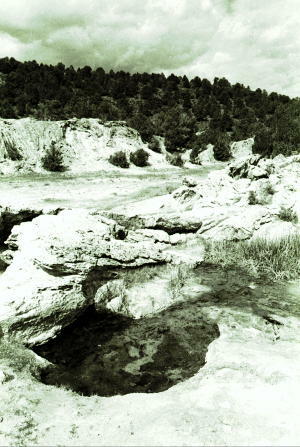 The Travertine springs are located about a mile and a half south of Bridgeport. To reach the area, drive a half mile south on Highway 395 to Jack Sawyer Road. Turn left onto Sawyer Road, then left again onto a marked somewhat rutted dirt road (not recommended in the winter unless you have four-wheel drive). Continue another mile to the springs. There is a strange, somewhat off-planet feel to the Travertine site. Because of the presence of the mildly sulfuric hot springs and alkali-saturated soil, little grows in the area. The result is a stark, barren terrain dotted with brackish pools, muddy fields carpeted with stunted salt-coated grasses and unusual-shaped mounds and half-domes of soft clay. Indeed, the name, "Travertine," comes from the whitish calcium carbonate crystals deposited by the mineral-laden hot spring water. There are several pools at Travertine, including a nice partly developed round pool on the high ground above the area, adjacent to the dirt road. A tad hotter than the lower pools, this one is popular with veteran hot spring aficionados. The lower pools are interesting. An inch-wide trough has been carved along the ridge of a mound. Hot water bubbles from the top of the mound and spills down the little cut to a series of four pools at its base. Water then flows from one pool to the next, cooling along the way. Naturally, that means the first pool is the hottest (an estimated 105 degrees), while each subsequent pool is a little less intense (the last pool, which is the largest and most shallow, is about 90 degrees). Because the Travertine springs are accessible and relatively well known, expect to run into people there, unless you come early in the morning or at night. The Bridgeport area is seemingly surrounded by undeveloped or partially-developed public hot springs. Another good prospect is the Buckeye Hot Springs, located about 11 miles northwest of Bridgeport near the Buckeye campground (directional signs five miles north of Bridgeport lead from Highway 395 to the spring). This spring is located near the side of a hill. A clever damming system allows soakers to control the heat of the water by introduce colder water from a nearby stream to mix with the hot water from the spring. Rude, undeveloped campsites can be found in the area. As with the Travertine area, you must take a dirt road to reach the Buckeye spring and should utilize a four-wheel vehicle in the winter. Of course, the best part of both the Travertine and Buckeye springs is that there is no charge for admission at either. What a deal. Recently, my daughter asked me how Reno got its name. She’d heard two versions of the story; one was that Reno was named after the guy who didn’t show up in time to rescue Custer at the Battle of Little Big Horn, and the other was that the city was named after a Civil War hero. 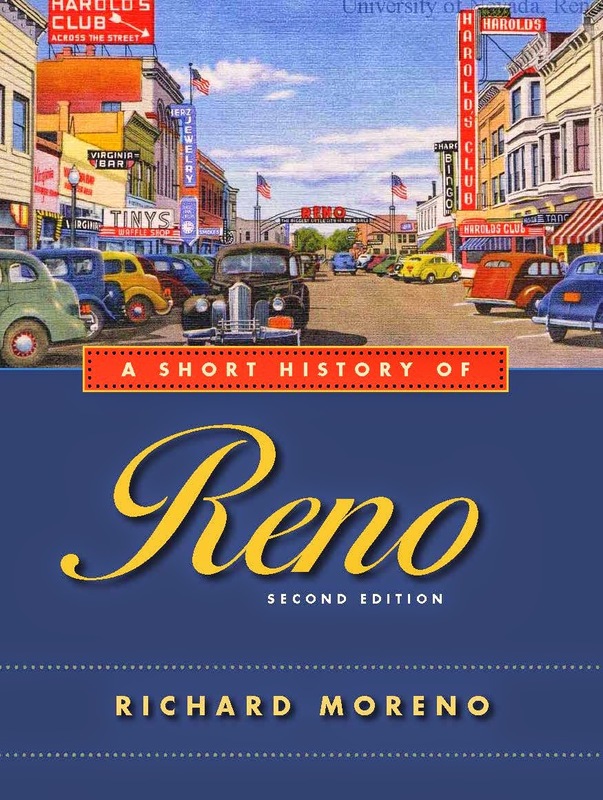 So, we decided to check out the Nevada Historical Society, located at the north end of the University of Nevada, Reno campus, to see if we could find anything about Mr. Reno. Founded in 1904, the Nevada Historical Society in Reno is Nevada's oldest museum. Over the years, the society has accumulated an unequaled collection of historic books, writings, photographs and other items about the state. The Historical Society combines a photo and manuscript library with a small Nevada history museum. A few years ago, the society’s home was renovated and enlarged to accommodate its growing collection of Nevada-related materials. Once we were inside, my daughter was immediately attracted to the society’s large display of prehistoric Native American artifacts, including rows of handmade Paiute, Washo, and Shoshone Indian baskets and cradleboards. Many of the baskets are the work of a legendary Washo artist, Dat-so-la-lee, who, in the 19th century, created dozens of magnificent grass baskets with intricate weaves and designs. Because of their quality, some Dat-so-la-lee baskets have been valued at tens of thousands of dollars. We continued to explore. We found a replica of a Native American grass dwelling as well as exhibits describing Nevada’s mining history. My daughter found a number of vintage gambling devices that didn’t look like anything she’d ever seen before---strange, mechanical card devices, wooden slot machines, and a big wheel with pictures of dice. In one corner, we found a couple of antique bicycles with wooden wheels and handle-grips and the most uncomfortable-looking wooden seats. I told her the story about one thing I recognized, which was an old, stained sack of flour sitting in a display case. The 50-pound sack was originally owned by Austin, Nevada shop owner Reuel Gridley, who, in 1864, lost an election bet and had to carry it through the town. Following his walk, he auctioned the sack with the proceeds donated to the Sanitary Fund (precursor to the Red Cross). The sack was resold several times that day, generating some $5,000 for charity. Gridley was later asked to repeat the auction in other Western towns and eventually raised nearly a quarter-of-a-million dollars for the Sanitary Fund. Other displays included a large neon sign from an old Reno bar (“The Phone Booth”) as well as maps, photos and paintings depicting early Nevada, vintage clothing, and beautiful leather saddles and boots. Of special note is the society's gift store, which offers Native American jewelry, unique history-related gift items and a large selection of books on Nevada. The Historic Society also publishes an excellent quarterly magazine containing scholarly articles about Nevada history. 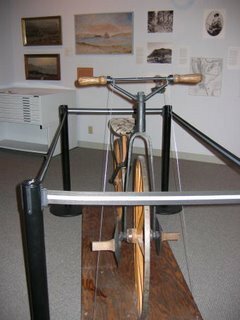 The Nevada Historical Society is open Monday through Saturday 10 a.m. to 5 p.m. It is located at 1650 North Virginia Street on the north end of the University of Nevada-Reno campus, adjacent to the Fleischmann Planetarium. For more information call 688-1190. Oh, we also discovered that Reno is named by the Central Pacific Railroad in honor of General Jesse L. Reno, a Union officer killed in the battle of South Mountain, Maryland in 1862. If you’ve ever been to Fort Churchill more than once, you know that it looks a little different with each visit. 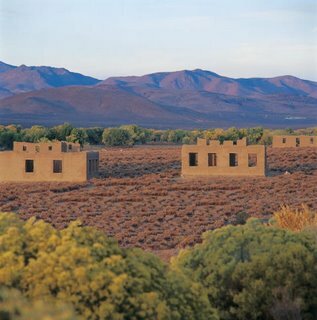 The fort’s appearance changes because of the way the sunlight plays with its adobe ruins, painting ever-changing shadow portraits on the taupe walls. The contrasts between light and dark are the greatest in the early morning and late afternoon. Fort Churchill was built in 1860 by the U.S. Army to provide a home for a garrison of troops that would protect western Nevada settlers, who feared an Indian uprising. Earlier that year, local tribes had fought with the white settlers in the Pyramid Lake War. The dispute started after three white men kidnapped two Indian women at a place called Williams Station, a trading post located about 30 miles east of Carson City. A traveling band of Indians heard the women’s cries for help. They responded by rescuing them, killing the kidnappers and burning the station. Stories about the raid began to spread—and naturally became more exaggerated. A short time after the Williams Station episode, a group of 105 volunteer civilian soldiers gathered in Virginia City to march on the Paiutes at Pyramid Lake. The ill-prepared Virginia City war party encountered Paiute warriors in a small valley located a few miles south of Pyramid Lake. About two-thirds of the volunteers perished in the conflict. The victory led to retaliation by regular army troops. At a second battle near Pyramid Lake, the outnumbered Indians were defeated. To prevent further unrest, the U.S. Government built Fort Churchill in July 1860. The fort also served as a deterrent to prevent attacks on Pony Express riders, who were occasionally chased by Indians. The fort later became a western outpost for the U.S. Army during the Civil War. While the Nevada garrison was never called into action during the war, it was an important training ground and supply depot for the Nevada Military District. In 1869, the U.S. Government abandoned the post, which was expensive to operate, and auctioned the buildings. The wooden roofs, supports and porches were removed and sold, but the adobe walls remained. Wood from the fort was used to build Buckland Station, a stagecoach stop and hotel, which still stands about a mile from the fort. Today, visitors can sometimes observe workers place new adobe bricks that are manufactured from local clay onto the walls. The bricks are made from the original materials used to build the fort and replace those that have been worn down by the elements. On a bluff overlooking the fort site is an excellent visitor center—a whitewashed, wood-shingled building that resembles the original structures. Inside, visitors will find a miniature model of the fort as it appeared in the 1860s. Back then, all the adobe walls were painted white and each building had a low, over-hanging roof, which also served to protect the adobe walls. Additionally, there are displays of authentic 1860s U.S. Army uniforms and weapons as well as exhibits on the fort's construction and the Pony Express. A park ranger is available year-round to answer questions about the fort. Adjacent to the visitor center is the pioneer Fort Churchill Cemetery. While the Army removed its dead when it abandoned the fort in the late 1860s, visitors will find wooden markers designating a handful of frontier folks who were buried there. An interpretive trail leads from the visitor center to the fort ruins. Along the way visitors can discover the location of the two-story officers quarters, the parade grounds, hospital, troop quarters, the armory and other buildings. Below the fort, in a beautiful cottonwood grove on the banks of the Carson River is a developed camping and picnicking area. The best time of year to camp is in the fall when the trees have turned brilliant shades of yellow and brown. The Nevada Division of State Parks has 20 shaded campsites (with no hook ups), RV dump station and picnic tables in the area. Fort Churchill is located 45 miles southwest of Fallon via U.S. 50 and Alternate 95. For more information contact the Fort Churchill State Historic Monument, 775-577-2345. There is a grave at Deadman’s Creek Trail near Washoe Lake. I’m not sure if anyone is buried there—or who it is—but there is a small wooden cross, flowers, and cards marking the site. But the grave isn’t why anyone would want to visit Deadman’s Creek Trail, part of Washoe Lake State Park. The reason to seek out this easily overlooked trail is because it passes through a peaceful, little oasis of vegetation that borders a spring-fed creek before leading to a gazebo that offers some of the best views of the area. Located directly east of the main entrance to Washoe Lake State Park, which is 10 miles north of Carson City, the trail doesn’t seem part of the state park because it’s on the other side of East Lake Boulevard from the rest of the park. The trailhead, which is marked with a wooden sign, can be found adjacent to a small, paved parking lot. After passing the mysterious gravesite, the trail winds through the bitterbrush and sagebrush for a few feet before crossing a small wooden bridge. From there, it meanders uphill alongside a ribbon of thick vegetation that includes cattails, various grasses and shrubs. If you look closely, you can see evidence of a fire that damaged much of this riparian area in 1999. Fortunately, nature has a way of rebounding so much of the native foliage has returned. While not particularly large, this refuge is home to a number of migrating birds and nesting species, according to the Lahontan Audubon Society. Birds that have been sited in the area include long-eared and great horned owls, Cooper’s Hawks, Black-billed Magpies, Lazuli Buntings, Blue-gray Gnatcatchers, wrens and sparrows. During our recent visit, we weren’t knowledgeable enough to know the names of the birds but heard and saw plenty hopping through the brush. The sounds, however, are perhaps the most pleasurable aspects of the hike. The calm gurgling of the spring-fed creek, the faint chirping of the birds, the buzzing of bees and wasps and the rustling of unseen things bring the nature area to life. The trail parallels the creek and vegetation for about a quarter mile before beginning a steep climb above the growth. As you continue onward, it’s best to periodically look back, toward the lake, to enjoy the marvelous views. The path zigzags up the hill. In several places, wooden steps have been built into the hillside to assist you during the climb and to show you where the trail is in case you’ve wandered off of it. If you look to the east, you can see the rising hills of the Virginia Range. Brown and somewhat barren, particularly at this time of year, the range is crisscrossed by several dirt roads and trails—popular with off road vehicle riders. 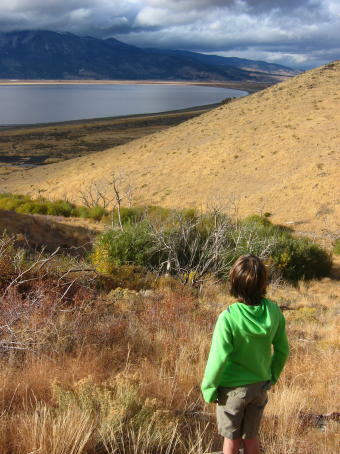 To the west is Washoe Lake, a remnant of a prehistoric inland sea that once covered much of Nevada. In the distance, you can see the majestic Sierra Nevada range including Slide Mountain. The trail continues to climb before reaching the crest of a hill. It ends at a picturesque wooden gazebo that overlooks the lake and Washoe Valley. This is a great spot to stand for a moment, feel the breeze on your face, and enjoy the views. Then, it’s back on the trail for the return walk to the car. Since the entire hike is only about a mile roundtrip, the Deadman’s Creek Trail is a fine, short, easy day hike that can be done in less than an hour. For more information contact Washoe Lake State Park, 4855 East Lake Blvd., Carson City, NV 89704, 775-687-4319, www.parks.nv.gov.